“Current affairs” factor into our decisions when we’re kayaking. If there’s next to no surface current, we’ll often just dawdle along, soaking up the scenery. When the current is stronger and it’s going in our direction, the paddling is easy so we’re able to make good speed towards a destination. By contrast, going against the current can make for hard slogging, so we usually try to time our passages to match its direction – especially if we’re heading home after an already lengthy paddle. At worst, if we’re fighting a current, we hope it’s a minor one. But currents can be localized and dynamic, changing several times over the course of the day. So how do we judge their relative speed and direction? 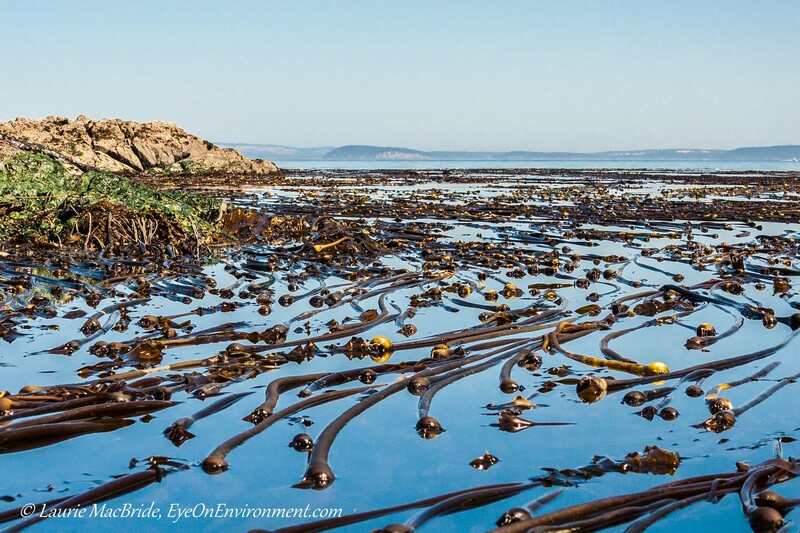 If it’s summer, we look to the kelp beds along the shorelines and rocky reefs we love to explore. Bull kelp is attached to the sea floor by a holdfast, with its stem growing up (sometimes as much as 80 feet) to reach the sunlight. A bulbous bladder keeps the plant’s long, thick fronds floating near the surface where they can photosynthesize. As we paddle along we take note of which way the kelp is streaming. The fronds flow in the same direction as the current, cascading out like long locks of hair. How extended these tresses are tells us the relative speed: the more they stream out in one direction, the faster the current. When they’re hanging straight down or floating lazily in all directions (as in the photo below), the current has slowed or stopped – usually an indicator that it’s starting to reverse direction. As in life, we sometimes have to paddle against the current, which gets tiring. So whether the fronds are with or against us can make a big difference to how we feel at the end of the day. 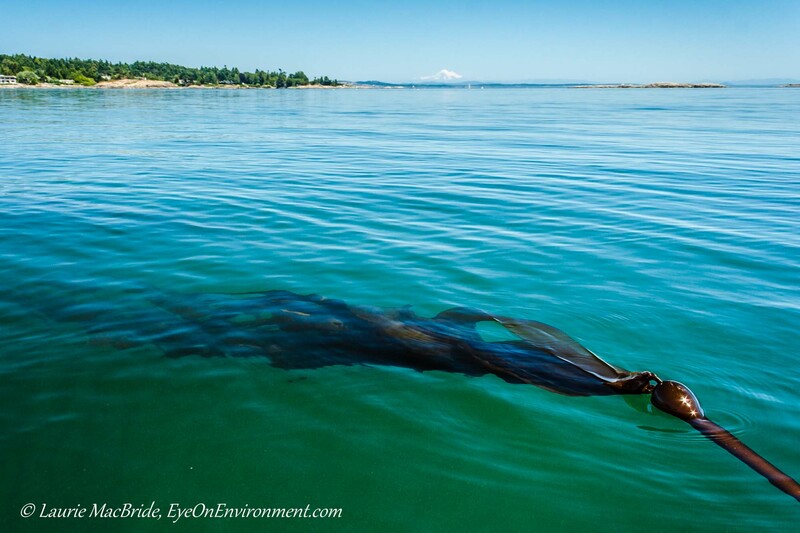 Posted by Laurie MacBride, Eye on Environment on September 22, 2015 in BC coast, Boating, Musings on Life and tagged kayaking, kelp, movement, nature, ocean, photos, plants, shoreline, summer. what a magnificent post! Though I have been aware of how the kelp flows in the direction of the current, what I didn’t realize is that bulb is actually a bladder to keep the kelp floating to the surface. Brilliant. Thank you. You’re welcome! I think a lot of people don’t know that much about kelp. It’s a pretty interesting plant. The photos are really information, thanks for sharing. You have given birth to a wonderful new expression — May the fronds be with you! Great post. Glorious images. You’re too kind Sherry! Thanks, and I’m pleased to hear how much you liked it. 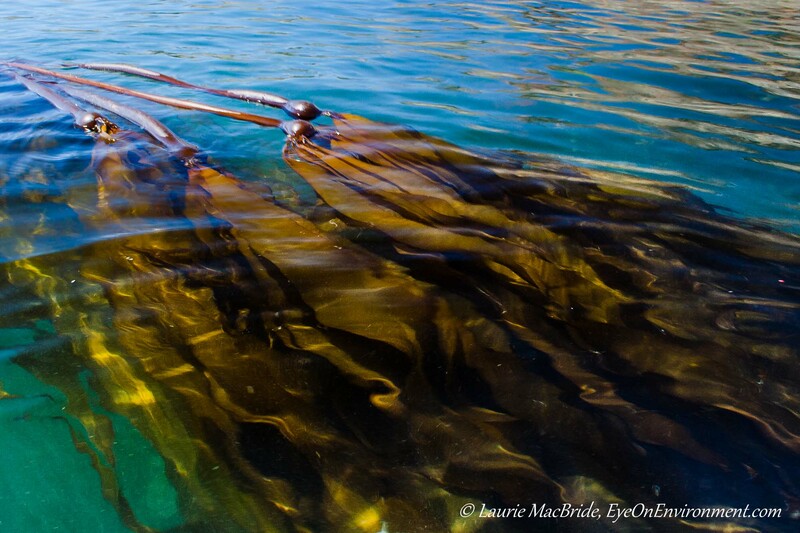 The kelp beds really are beautiful. I hadn’t thought of that, but you’re right, they do! Thanks for your kind words and comment Gudrun, and I hope you are well.